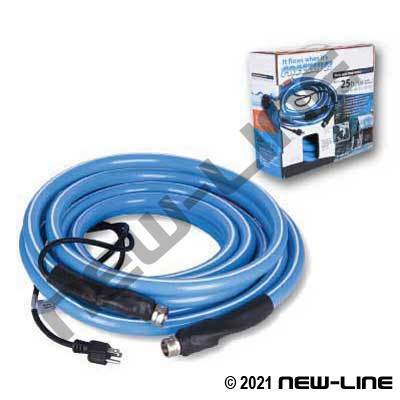 The heated garden hose & water supply line is used in applications where users do not want the water to freeze inside the hose during the winter season - such as on a farm, livestock feed areas, R/V, carwash, residential, or other light commercial water supply applications. Once plugged in, a built-in thermostat (under the black bend restrictor at coupling) will activate a heating element through the hose and prevent the water from freezing if temperatures outside the thermostat fall below 5-7°C (40-45°F) and then will turn off if over 12-14°C (50-57°F). You do not have to plug/unplug the hose and turn on and off, the thermostat will monitor and do the work. Do not cover or insulate the thermostat and ONLY plug into a Ground Fault Circuit Interrupter (GFCI, does not work with DC voltage). This hose will NOT provide freeze protection for the water supply pipe/copper tube, hose bib valve, or spigot - it simply keeps the water flowing through the hose and does not heat the water or components. It meets UL499/CSA C22.22 no.72 requirements and is manufactured with FDA compliant compounds. Although it is manufactured with FDA compliant compounds for drinking water, it is generally not for use in critical or permanent applications. Inspect the cord before using (comes with a 6ft cord, extension cords should not be used). Do not pull/tug on the hose and choose the proper length as power does not pass from length to length if daisy-chained together. Store indoors after winter season or when not in use. Typical Fittings: 1/2" & 5/8" are factory assembled with chrome plated brass GHT fittings, black bend restrictiors and a 6ft plug in cord .2" are factory assembled with aluminum camlocks and black bend restrictiors with a 6ft plug in cord, Note: These assemblies cannot be cut/coupled or repaired. Construction: Tube: Black PVC. Cover: Smooth, orange PVC with longitudinal blue stripe. Reinforcement: Textile cords. Notice: Dangerous Assembly, ensure coupled/maintained properly.